WikiMe [iTunes Store Link] was just released by SupportWare for the iPhone and iPod Touch. 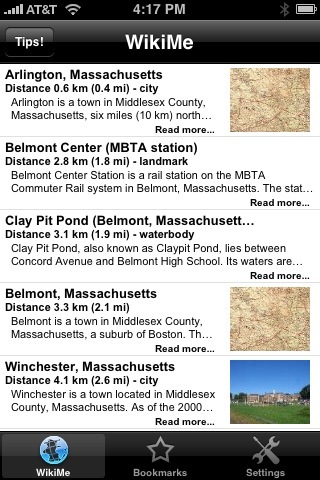 WikiMe is another great application of the CoreLocation service built into the 2.0 Mobile OSX firmware. When you launch the app, it grabs your location and then shows you a list of Wikipedia articles of places in a configurable radius around your location. 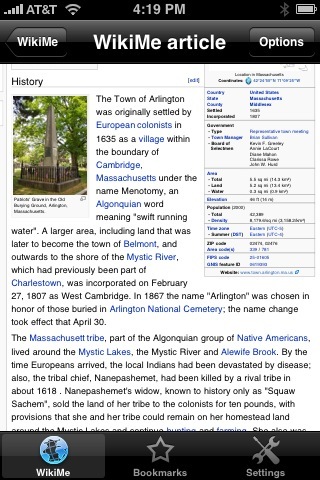 Touch an item in the list, and you view the Wikipedia article page in a built-in browser. From there you can show the location of the article’s subject in Google Maps, Bookmark the page in WikiMe’s bookmarks list, or e-mail a link to the Wikipedia article to a contact. You’re not restricted to seeing articles for your immediate location though, you can plug in any zip code and get results, regardless of where you’re currently located. I can see this app coming in very handle while traveling, especially in areas with a lot of history. It’s like a social media tour guide. At $0.99, I think the app is a great deal. Cheap enough to be bought without hesitation, but the authors are still getting compensation for their nicely executed app.